Looking at this logically, Loraine obviously had instructions to text the box if the hit on Dougie Jones was not immediately successful. This would tell Bad Cooper that Good Cooper was being protected, because it should have been a no brainer hit. The box was probably there to set something in motion automatically, because Bad Cooper knew he might be incapacitated after the swap. The day after Loraine sent the text, Mr. Todd gets the red box on his screen that prompts him to put Ike the Spike on the job. Again, this was something set up ahead of time, the envelope with Dougie’s and Loraine’s pictures was already in his safe. Bad Cooper most likely did not initiate that action, he was still in jail at that point (I think the “Cow jumped over the moon” message was an activation for Diane). So, I think it’s nothing more than that, a pre-setup plan B for killing Good Cooper after the swap. Largely, I stand by everything I wrote back then, but it all warrants another look, and more importantly, a deeper dive. In this article, we’re going to revisit the theories surrounding the black box, analyze them, and see what we can figure out. 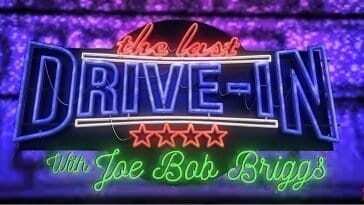 In Part 5, “Case Files”, the first scene takes us to Las Vegas at night. Lorraine, with a bruise on the left side of her jaw, calls her two hitmen camped out in Rancho Rosa for a progress report. Or rather, a lack of progress report. They’re not sure if Dougie Jones is still inside the house they’ve been staking out, but the lights are on and his car’s still there. Lorraine is a worrier, and she worries that they’re going to get her killed. The job was supposed to be done yesterday. After hanging up on them, she frets at her desk for a Lynchian feeling 15 second before pulling a Blackberry out of her drawer and sitting it in front of her. She frets some more. She turns it on and types “ARGENT”. We cut to what appears to be a dirt basement, with upper windows at street level and a bare bulb shining down. A black box sits in a bowl on the floor between two beams. The box trills a little incoming-call type ring. Notice, she hasn’t sent any message yet. She’s merely typed in the addressee, and they are already connected. Cut back to Lorraine and after fretting just a little bit more, she types one character, the number “2”, into the Blackberry. She pulls the screen down into view and we see “ARGENT”, “159” and “2” on the screen. Again, she doesn’t hit send, she just types in the number. Cut back to the black box. It beeps twice and flashes two red LED lights. End of scene. So, what did we just see? First of all, let’s talk about the BlackBerry. Intrepid Redditors immediately identified it as a BlackBerry model 6230, released in 2003 . Her first key stroke turned on the phone – there is a power button on the front of the device in the lower right. Good so far. When the BlackBerry 6230 turns on, it displays a menu of apps, with “Messages” being the first one. So the quick keystroke before she types the 6 letters would seem to have entered the messaging app. She may also have hit the “CAP” key, which is to the right of the space bar. It’s a little unclear if her finger is merely hovering nervously over that area initially or if she is actually making contact with keys. In the messages list, click the trackwheel. Type the SMS-compatible phone number. Clearly, Lorraine did not go through all of these steps. Now, does that mean anything? Probably not. 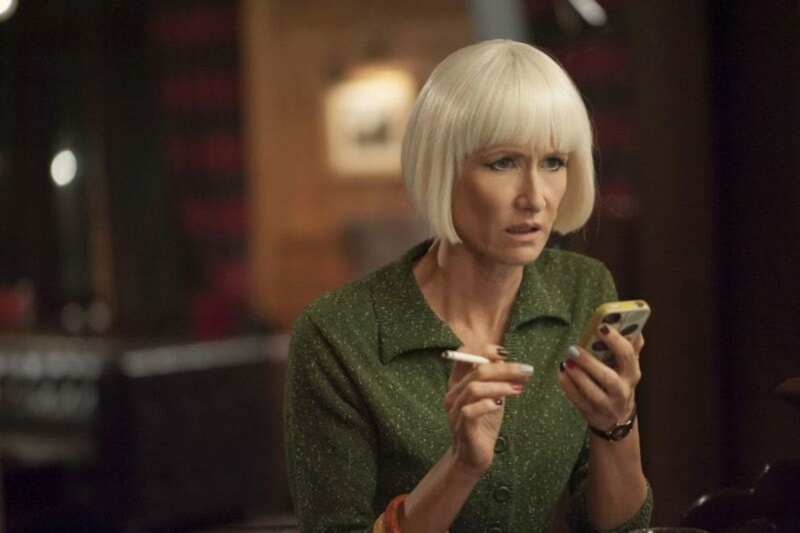 Lucy may understand how cell phones work now, but I’m not so sure David Lynch has ever really cared. Much of the technology, especially cell phone screens, that we saw in season 3 was “dumbed down”. Think of the big red “BLOCKED” on Diane’s phone while she was on the plane. Focus on the donut, not the hole. Still, if you watch her finger as she pecks out “ARGENT” on the keyboard, it doesn’t look like that’s what she’s typing at all. She’s poking on keys in the lower right of the keyboard. The letters A-R-G-E-N-T are mostly in the upper left of a QWERTY-format keyboard like the 6230 has. If you watch what she types, slowing it way down, it looks like she actually hits 7 keys, and she might be typing “BJBHHHH”, or perhaps “NKNJJJJ”. Certainly, her finger strays nowhere near the “A” key, located to the far left. Again though, maybe Lynch simply doesn’t care. Maybe he didn’t tell the actress specifically what word to type because of the high security surrounding the production, and he merely instructed her to punch a few keys. We will likely never know. One way or another, whether in this reality or the next, we later see that she typed in “ARGENT”. Now, there were all kinds of crazy theories about “ARGENT” at the time, and what that might have meant . Argent means “silver” in old English, and silver has alchemical links  to the moon, as mentioned later in Bad Cooper’s phrase “the cow jumped over the moon” . 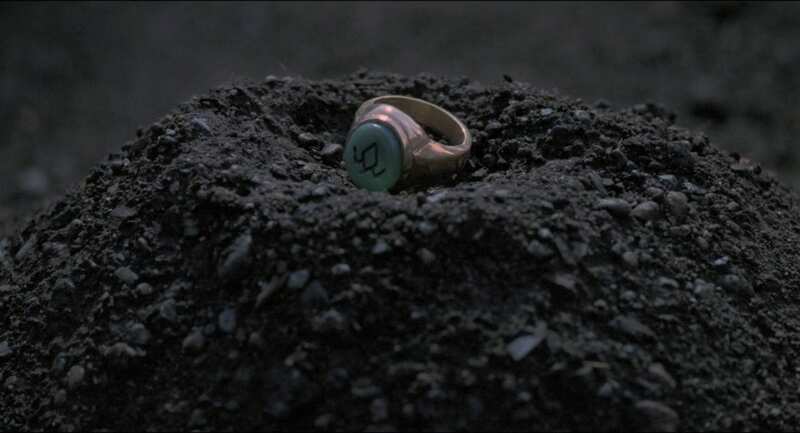 Or maybe it’s linked to the black box shrinking to what might be a lump of silver at the end of Part 5. Or perhaps that was a lump of tin, because argent also means “tin” in Spanish. Or maybe… we were all digging just a little bit too hard. The obvious choice is that it was simply short for “Argentina”, which is where we later learn the black box is located. I won’t say for sure that any of those other theories are flat out wrong (oh hey, it also means “money” in French), but they don’t hold any water for me personally. The next thing we saw on that screen, to the right of “ARGENT”, was “159”.  This also generated a bit of a swirl, but the answer this time is rather straight-forward. The SMS messaging format used by BlackBerry circa 2003 had a 160 character limit (which they continued up until around 2009, as evidenced by a quick Google search). After Lorraine used one of those characters, there were 159 left, as displayed on the screen . Finally, when she works herself up enough to type out the “2”, we are shown Lorraine’s finger hitting the “E/2” key (presumably after she hit the left shift key to type the number, not the letter). The message “2” implies that it was one of two outcomes for the Dougie Jones hit: “1” = success and “2” = failure. Lorraine is very scared to text “2”, likely because of the bruise. Remember that when Duncan Todd instructs Roger to “tell her she has the job”, that prompts Roger to ask his boss why he lets Bad Cooper make him “do these things”. We might think at first he means taking out hits on people, but he might also mean that the job offer came with a little punctuation mark at the end. An offer she can’t refuse, so to speak. This being day 2 of the stakeout, she could have received that bruise when she reported her status at the end of day 1. I find that a bit unlikely though, because that would mean she had personal interaction to report in for day 1, but impersonally texts in her status for day 2. As mentioned, she never hits send, she never touches the trackwheel, she basically doesn’t go through any of the real steps that a BlackBerry 6230 required to send a text message. The BlackBerry and the black box seem to be instantly connected to each other. Now, she did have to type in “ARGENT” to activate that connection. There could be other devices that BlackBerry had potential to connect to, perhaps an entire network of these devices even. Diane’s text message from Bad Cooper traced back to a server in Mexico, for example. Upon receiving her “2” message, the two red LEDs blink twice and the black box beeps twice in concert. It sits idle for two seconds and we cut to the next scene. Bookending Part 5, the second scene featuring the black box happens at the end of Part 5, before the credits roll on Good Cooper transfixed by the cowboy statue outside Lucky 7 Insurance. 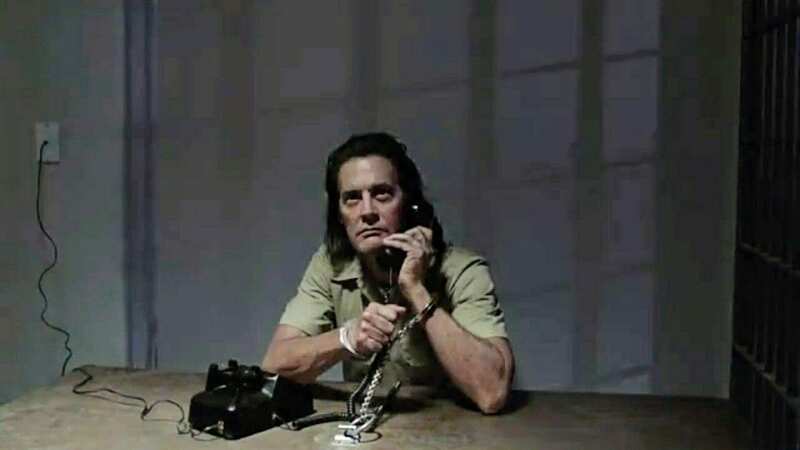 Bad Cooper has been given his “private” phone call, creating all manner of chaos in the prison security system, during which he speaks the phrase “the cow jumped over the moon” into the handset, hangs up, and everything goes silent. Cut to an aerial view of Buenos Aires, Argentina. We see the bare light bulb again, but this time we get to see much more of the room that the black box is in. The camera pans across a bit of the room and down to the same view of the black box once again. And once again, it beeps and blinks twice. No incoming-call signal this time though. Immediately after beeping, it implodes upon itself, leaving behind a small lump of some silver tinted metal. End of scene. First of all, yes, once again the Reddit brain trust, hard at work for you, attempted to decode the numbers Bad Cooper punched into the phone . Like Lorraine’s key punches, the tones seem to not match what was visibly seen on screen. Impressive detective work, but ultimately probably irrelevant. The real question is whether or not Bad Cooper talked to the black box? The scenes were back-to-back, but that doesn’t necessarily imply cause and effect, especially in this third season of Twin Peaks. On the other hand, Mark Frost has told us that season 3 was presented largely in chronological sequence. Let’s look for clues. Comparing the two black box scenes is very interesting. The same beam of light appears to be shining in the same orientation across the black box. In fact, it’s exactly the same. This also holds for the bare bulb and the window behind it. Exactly the same. We might be inclined to think it *is* the same scene, excepting that we got to see a little more of the room in the 2nd scene. However, the scenes do end differently. 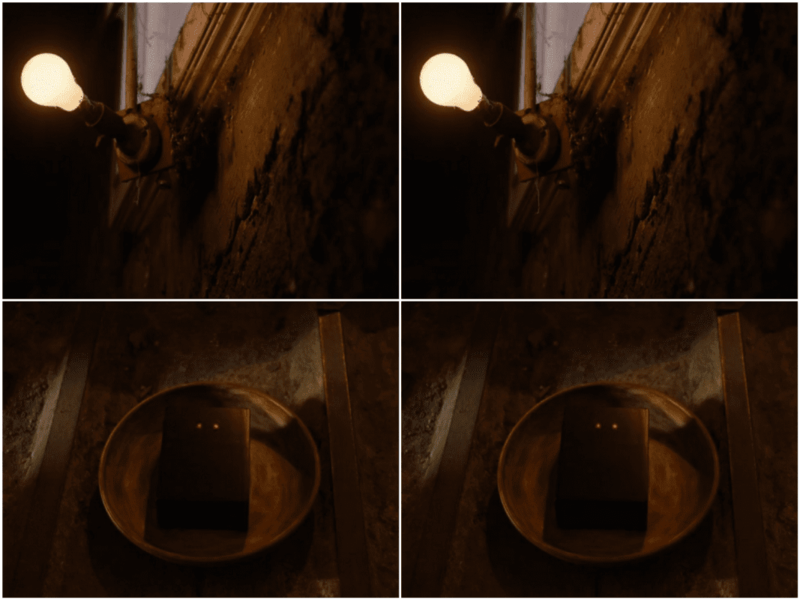 In the first scene, after the double beep, we remain looking at the black box for 2 seconds before cutting away to the next scene. 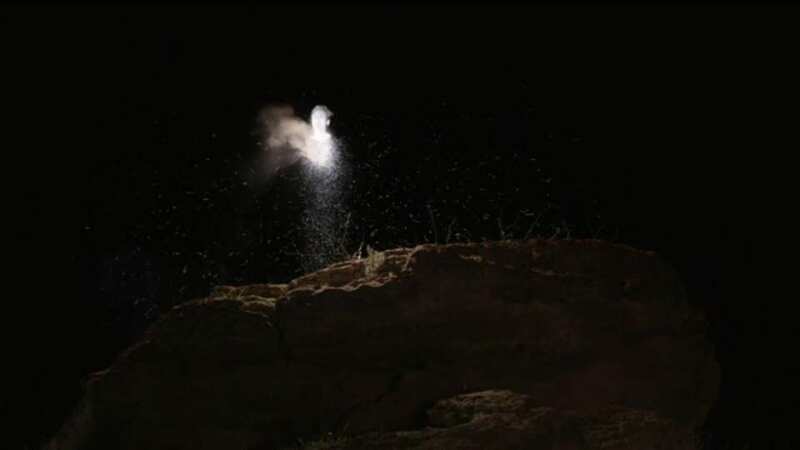 In the second scene, the black box implodes immediately after beeping. So, they are not in fact the same scene, though they look to be roughly, or even exactly, at the same time of day. 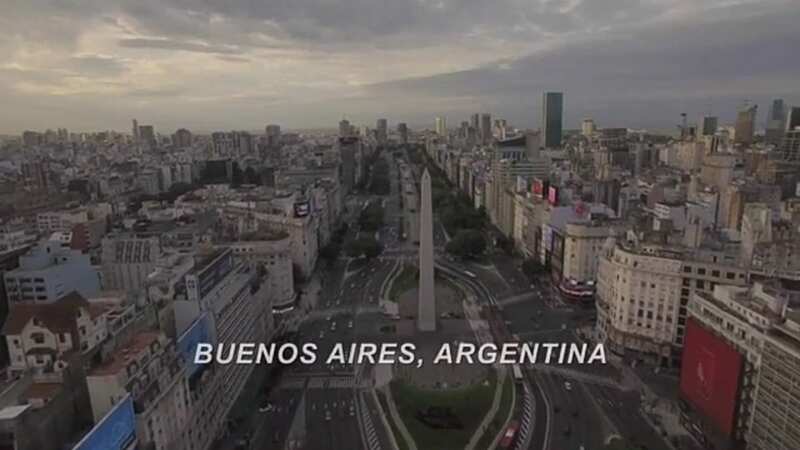 The aerial shot of Buenos Aires that begins the second black box scene was set during the day time, perhaps late afternoon and a little overcast. We get a better look at the window also, as the camera pans around the room, and though we can still only see the lit window sill, not anything actually outside, it would seem to confirm the time of day. Lorraine’s scene in Las Vegas is very definitely at night. Her men are not surprised that there are still lights on at the house, so it would seem like early evening. The prison phone call scene looks to be happening in daylight, based on security camera images of hallway windows. Again, maybe late afternoon and overcast, from the look of it. Buenos Aires is 4 time zones ahead of Las Vegas, and only 2 time zones removed from eastern South Dakota. If we assume the two black box scenes are at or near the same time of day, it can be late afternoon in both Buenos Aires and South Dakota, but it can’t be early evening in Las Vegas and late afternoon in Buenos Aires. That can’t be right. Only Las Vegas (first scene) and Buenos Aires (second scene) were definitively shown to us from an outside view that confirmed day or night. Las Vegas is lit up all night though, so maybe what appears to be early evening is in fact 5 a.m. The prison windows could be frosted over, we aren’t getting the greatest view of them, and thus could be oriented to an inside view, such as of a cafeteria space. Likewise, the light at the window and the light showing across the black box could be interior lights, rather than exterior. But honestly, none of those explanations feel right when you watch the scenes. The black box scenes could be out of order, despite Mark Frost’s assurances. Lorraine definitely connected to the black box via “ARGENT” on the BlackBerry (OK, well, as definitely as anything else this season), despite the apparent time discrepancies between early evening in Las Vegas and late afternoon in Buenos Aires. There could be time delays involved, or maybe (you know I have to say it) there could be parallel timelines at play here. No, we’re not going to go there. Whatever the case, Lorraine texts the black box, it activates and beeps twice for the incoming message. Then, sometime soon after that, it beeps again and implodes, having served its purpose. If the black box scenes are actually consecutive, placing the second scene at the end of Part 5 deepens the mystery of the black box, but the clues are there for us to piece things back together in the right order. This leaves Bad Cooper’s phone call as the odd scene out. If he wasn’t calling the black box, then who (or what) was he calling? That morning, he had just had his prison interview with Gordon Cole and company. Knowing them as well as Good Cooper knew them, he would know the FBI’s next move. He planned for it, in fact, two decades earlier. They would need to pull in the person who knew Cooper the best, to determine if this was the real Cooper. Diane. Only it would be Bad Cooper’s tulpa version of Diane. His sleeper agent, activated (or perhaps merely warned) with the phrase “the cow jumped over the moon”. I’ll grant, this is only my interpretation, but I think it makes the most sense, in the context of everything that was going on. So we said earlier that the black box imploded after having served its purpose. I worded it that way because of the obvious parallel that many fans have drawn to tulpa Dougie and tulpa Diane, the two other things that were “manufactured for a purpose”, as Philip Gerard puts it. Having served their purposes, they each imploded into a little golden orb, a “seed” as we would later find out they are called. However, that’s not exactly right either. In both instances, the little golden orb actually departs midway through the process. It floats around the imploding body as we cut to Gerard shielding his eyes from the final electrical burst. The tulpa’s body is completely gone and the seed is left sitting on the chair. The black box, on the other hand, does not produce a floating spherical orb during its implosion process. Rather, its entire substance shrinks down into a little irregular silver nugget, left sitting in the bowl. There is also no electrical burst at the end. Tulpas are thought forms endowed with enough vitality to become a real human being . That “vitality” seems to have been portrayed on screen in the form of those seeds. “Infuse the machine with gold”, to borrow a phrase that should be familiar to David Lynch fans. The same seed that made Dougie Jones is reused at Cooper’s request to “make another one”. The black box does not seem to be “living” in any relatable way. It is a machine that is not infused with gold. Its implosion is more like a self-destruct mechanism. Throughout season 3, we saw Bad Cooper do many amazing, magical things with electronic devices. I’ve used the term “technomancer” – he controls and manipulates technology through magic. So perhaps the black box was “manufactured” and/or “conjured” to serve his purpose, but more likely it’s just as ordinary router or modem that has been magically manipulated to work outside its normal operating parameters, like Bad Cooper does with the burner cell phone he gets from the warden. Either way, the next question is, what was that purpose? 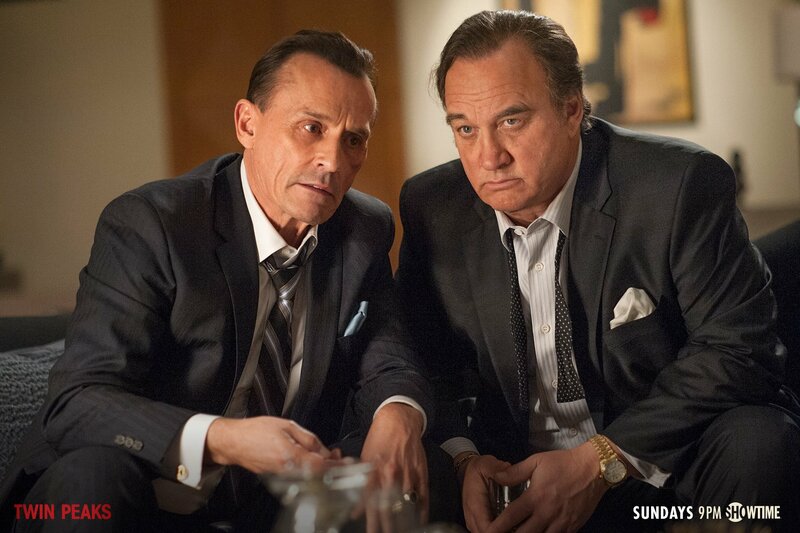 Bad Cooper tells Darya that he has a plan for not getting pulled back into the Black Lodge. He’s had 25 years to plan for this. He created a tulpa version of himself as a decoy for Good Cooper to swap with. 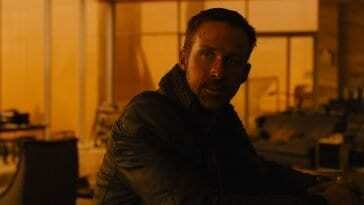 He set up multiple layers of hit men assigned to take him out as soon as he emerges into the real world. The glass box in New York and the interference by the doppelgänger of the Evolution of the Arm may have also been parts of this plan. Despite his planning, he probably realizes that there’s a chance that he could be incapacitated during all of this, and/or that his plan could even fail. I’ve even seen a theory that this is why he was driving recklessly on the highway as the time approached, something that always struck me as curious. If Good Cooper did swap in, he’d jump into a deadly situation with a speeding car and a trunk full of contraband. That makes a little bit of sense. His arrangements with Mr. Todd were probably made in person over the phone, because Roger knows enough about what’s going on to ask his boss about “him”. When he meets up with Chantal and Hutch, one of the first things Bad Cooper does is check in with Mr. Todd in person over the phone to get a status report. If something did go wrong though, it would be at the most critical moment to take out Good Cooper. He’d need to keep his plans in motion during his potential absence. Decisions would need to be automated. Mr. Todd was acting out these decisions, but he was not empowered to make them. Ike the Spike was a backup plan already put in place for him to execute. The pictures of Lorraine and Dougie Jones were already sitting in his safe, he just needed to get the red box signal to initiate the second hit. Of course, “this prison thing with that fucker Ray” wasn’t part of the original plan. Bad Cooper had to change his plans on the fly to account for that, and you can tell he’s not happy about it. This is the second change of plans he’d run into just before the swap. The mystery voice, let’s call him not-Jeffries, on the phone says he was missed in New York and Bad Cooper replies it couldn’t be helped. He had to be in Buckhorn for what was going down there with Major Briggs. If New York was to have been a first attempt on Cooper’s life with the glass box, then he could fall back on getting him in Las Vegas. After killing Darya and talking to not-Jeffries, he downloads the plans to the prison and sets off with the items in his trunk to get himself thrown into that prison, as well as the “Mr. Strawberry” blackmail to get him back out with Ray. He had already accounted for the possibly that he might be out of commission for a while, this just extended that a bit perhaps. The conclusion to me seems obvious. The black box was that automation put in place to ensure plans for killing Good Cooper continued to move forward without Bad Cooper’s involvement. Lorraine sends a “2” indicating failure that night, and the next morning Mr. Todd gets a red box on his screen that prompts him to initiate Plan B. Had she texted “1”, would there have been a green box? Maybe. Was there another envelope with just her picture in it? Well, Bad Cooper doesn’t like to leave loose ends. The black box itself even implodes once its purpose is fulfilled, leaving no loose end in Buenos Aires either. A bit extreme perhaps, or maybe that’s just the way technomancy works. We’ve got a few loose ends of our own to tie up. Let’s talk about some other interesting points surrounding the central mystery of the black box. 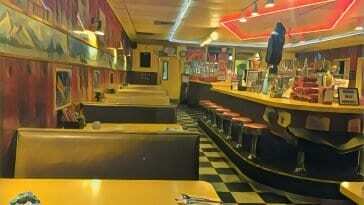 Buenos Aires is, of course, a location that is already well established in the Twin Peaks universe. This is where Special Agent Phillip Jeffries held a “long-term posting”, as Tammy puts it. Where he stopped investigating Blue Rose cases and started living them. This is where he caught up with the “shadowy suspect” Judy, who he believed was running the international criminal enterprise he was initially looking into. The last time Jeffries was seen on screen was in The Missing Pieces, apparating back into the Palm Deluxe hotel from his visit to Philadelphia. So one theory has it that the basement where we see the black box lying could be the basement of that very hotel. It does make a nice parallel to the basement of the Great Northern hotel, as another location where the boundaries between two worlds are perhaps just a little thinner. Tammy also mentions Buenos Aires as one of a series of locations around the world where “the Double” had established residences and businesses. So the basement we see could be in one of his own properties. Maybe a business, in this case, given the shelves full of paperwork. The self-destruct mechanism would serve to cover his tracks, perhaps physically and magically, if the location could somehow be traced back to him. There are several more South American references made in season 3 and Mark Frost’s two books. James Hurley ended up in Baja, Mexico, when he fled the bench warrant for his arrest in Oregon, and Diane’s text message from Bad Cooper was traced back to a server in Mexico. Yes, I know, Mexico is in North America. OK, let’s move a little further south then. The only known photo of Bad Cooper that the FBI had on file from the previous 25 years caught him outside a house he owned in Rio de Janeiro, Brazil. Albert gave Jeffries information about their man in Columbia, who was subsequently killed. This action likely helped Bad Cooper in establishing his own international criminal organization. Argentina was also mentioned by the Archivist as a location where some of the most talented and advanced Nazi engineers, those who resisted the overtures of Project Paperclip, escaped to after WWII. The bowl that the black box is sitting in is also interesting. Many have made the connection that it appears to be a “singing bowl” . Singing bowls produce a sustained ringing note when a mallet is rolled along their rim . These are used in meditation practice, which of course David Lynch is a big proponent of. The black box’s bowl appears to be brass, which is what traditional Chinese singing bells and bowls were often made of. Each bowl produces a unique resonant note based on its size and shape. 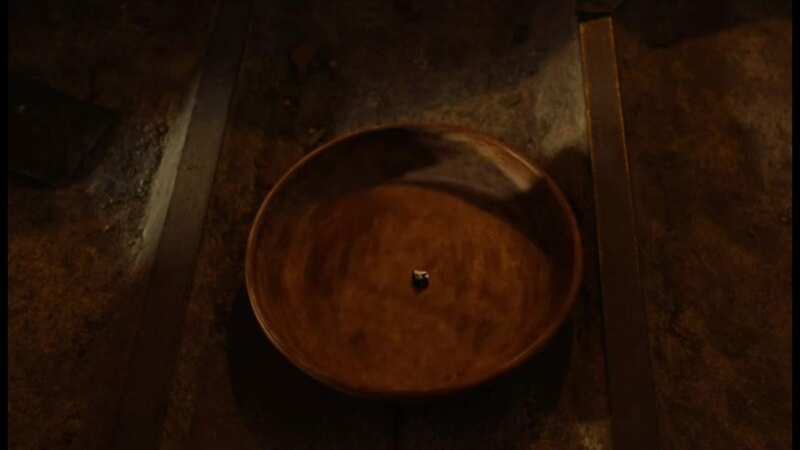 Perhaps the resonance of the bowl is either serving to power the black box device (note there are no wires in or out of it) or somehow enabling its connectivity to Lorraine’s BlackBerry and/or Mr. Todd’s computer. Could there even be a connection between the ringing in the basement of the Great Northern and the singing bowl in the basement of the Palm Deluxe (if that’s where it is)? Maybe that’s too much of a stretch. This might seem like a minor thing to note, but hanging from the bare light bulb is an old, dusty cob web that is visibly blowing in a gentle breeze. This is seen in both black box scenes. That and the rough hewn wall give the space a feel of an old mine shaft almost. 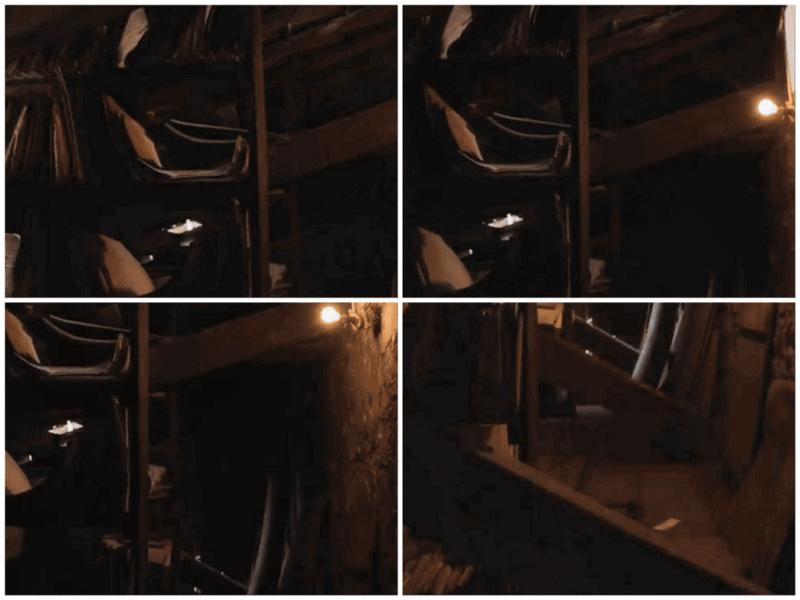 In fact, when you lighten up the scene as the camera pans down towards the black box, the two beams that the bowl is sitting between can be seen continuing further down into the tunnel. These are some sort of rails. However, they cannot be functional, as we also see that there are massive beams running diagonal in both directions, criss-crossing over the rails, as if supporting the crumbling walls. The ceiling is likewise composed of wooden beams. Further down the tunnel, natural light is coming in from the left, shining down on the floor just as it is on the black box in the foreground. It turns out that one of the great hidden mysteries of Buenos Aires is… wait for it… a system of hidden underground tunnels [13,14]. The tunnels were built around 1780, but the reason for the tunnels remains shrouded in mystery. It is believed they may have been intended to connect the city’s Jesuit churches for safety, should the native population have raised up against them. Likewise, the reason for closing them up remains a mystery. The tunnels were only recently rediscovered in 1985, leading to a large urban archeology project that has unearthed and restored miles of the tunnel networks. It’s all pretty interesting, and I recommend reading the two articles referenced at the end of this article to learn more. 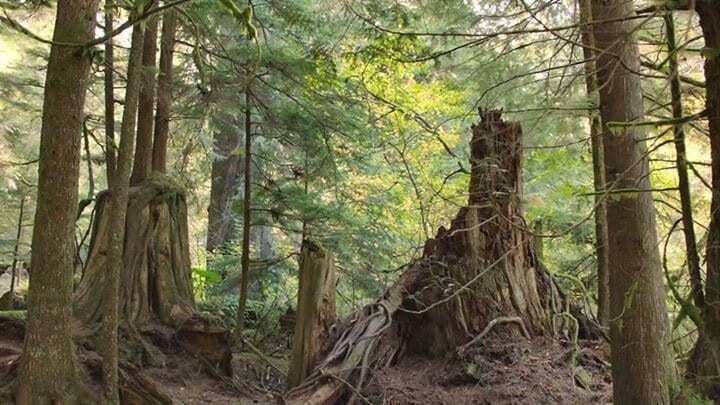 In the world of Twin Peaks, these tunnels may be indicative of another invasion by white men into a native population, upsetting the balance between man and nature, and unearthing something demonic as a result. I’d be remise if I did not briefly mention another weird little mystery that pops up during the first black box scene, namely the piece of cardboard taped up on the wall behind Lorraine’s desk. Many of you are probably asking yourself what I’m even talking about, because the glimpse of it was so brief and subtle, it was easy to miss. It shows a little better in Part 6 when Ike the Spike rushes in to kill Lorraine, but only a little better. Basically, it looks like the side of a large cardboard box has been torn off and crudely taped up on the wall with strips of black electrical tape. The wall underneath has something smeared on it, just poking out a bit on the lower right hand side. Early speculation tied this to the cardboard boxes scattered throughout the glass box room, or perhaps a mirror image to the “15” panel in the Mauve Zone . I think a more plausible explanation might be that it has something to do with Lorraine’s bruised jaw. Some sort of reminder was left for her, and while she’s tried to cover it over, it still hangs over her like a specter of doom. Whatever it is, it’s weird. Speaking of weird, let’s close with a couple of interesting tidbits about Ike the Spike that I originally brought up in the “Third Day Theories” article for Part 6. For one thing, his beloved spike actually says “Ike’s Spike” on the handle . You can see why he was so distraught when it was bent up after killing Lorraine and her staff. It might also be because he’s junk without it, proving completely inept at killing with a pistol later, even at short range. More interesting though is what he was doing when we first are introduced to the character. He sits at a desk in his motel room, rolling dice and apparently recording the results in a notebook, over and over. He looks to have been doing this for a while. This may be an obscure reference to the classic Illuminatus! Trilogy, in which a dwarf named Markoff Chaney used similar behavior randomizing tactics for “Operation Mindfuck” . There’s little doubt that the conspiracy theory underpinnings of Illuminatus! would appeal to Mark Frost’s sensibilities. 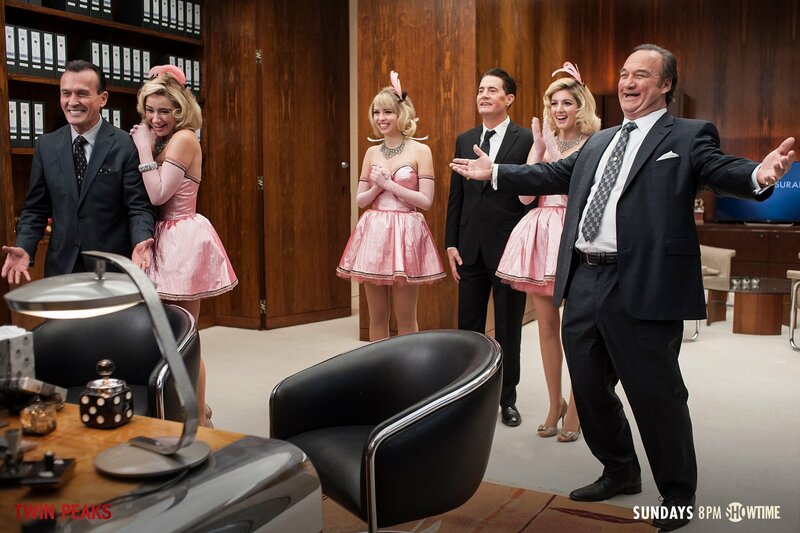 David Lynch’s sensibilities no doubt led to the selection of a dwarf to play the character. He has used little people previously in Twin Peaks, of course, and in many of his other works as well, usually as agents of the supernatural. Was this maybe what Ike was up to with the dice? 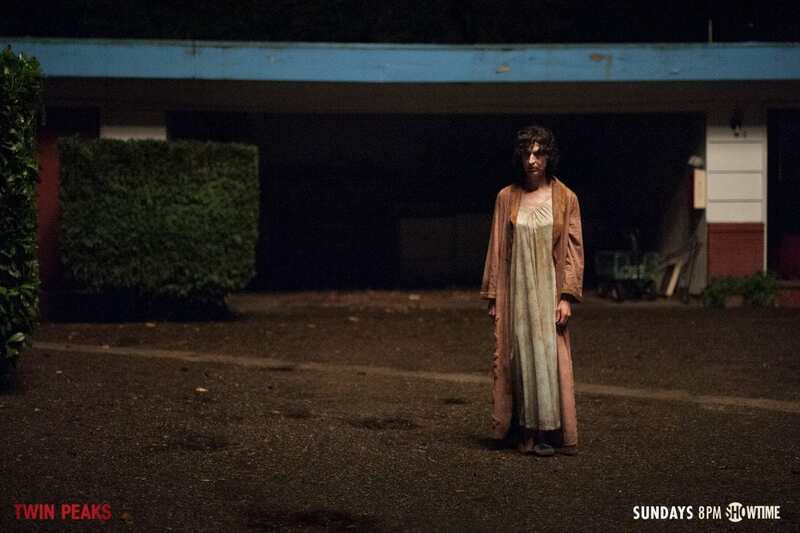 He’s living in a motel, which have been shown to be supernatural places within the expanded world of Twin Peaks season 3 . He’s engaged in some sort of game of chance, which have also been featured prominently in season 3, with Red’s magic coin, Mr. Jackpot’s slot machines, and the 119 Lady’s deck of cards. All imbued with a sense of the supernatural. Good Cooper seems to be supernaturally protected from the mundane Plan A hit, whether by his own innate talents or via the watchful aid of Philip Gerard from the Red Room. If Bad Cooper anticipated this possibility, he’d have a Plan B lined up that would be more capable of countering this supernatural protection. 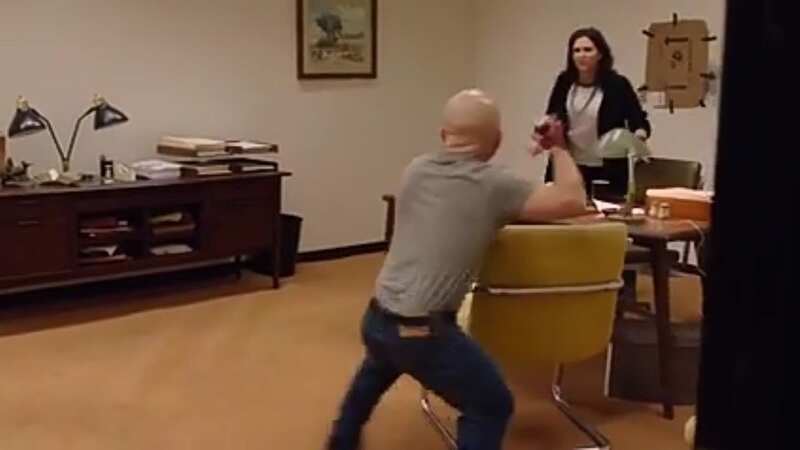 This might even explain why the Evolution of the Arm intervenes when Good Cooper faces off against Ike the Spike outside Lucky 7 Insurance, saying “Squeeze his hand off!” three times (repeating a phrase three times is another potentially magical theme played out in multiple instances during season 3 ). This was a supernatural attempt on Cooper’s life, met with a supernatural response. There are no definitive conclusions, of course, but hopefully we’ve moved a little closer towards something resembling the truth. We’ve also explored a lot of rabbit holes in the general vicinity, and found more than a few tasty carrots. 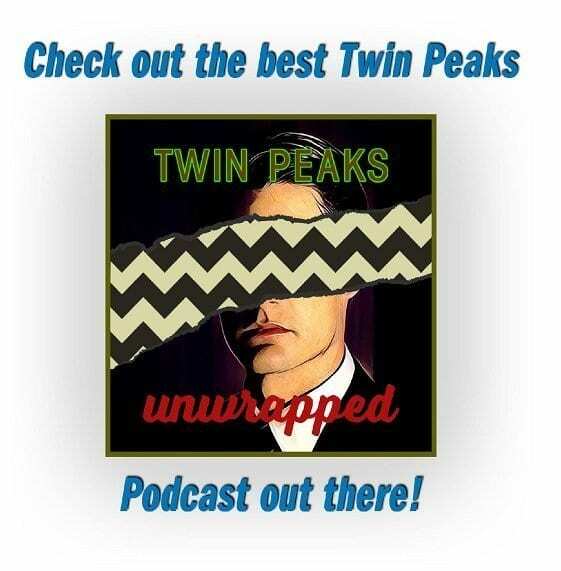 If nothing else, I hope I’ve given you some things to ponder and expanded your sense of wonder at the neverending fountain of mysteries that is Twin Peaks. As always, please reply below with your own comments and corrections, or give me your own well thought out theories and analysis. Catch you next time. For not crazy ideas about alchemy and Twin Peaks though, see Gisela Fleischer’s amazing article “Twin Peaks and Alchemy”. If you want to take a crazy and yet serious deep dive into the phrase, see Lindsay Stamhuis’ article “The Cow Jumped Over The Moon”. 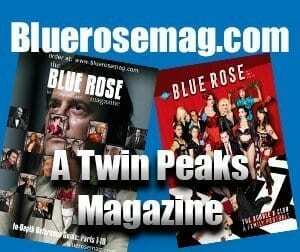 For more on motels and their roles in Twin Peaks, see Gisela Fleischer’s great article “Drama, Myths and Magical Connections – The Motels Of Twin Peaks“. No it couldn’t. You have your time zones completely backwards. Buenos Aires is ahead of Vegas, not behind. Yes, yes I do have it backwards. Sigh. I dont known how I managed to do that. I’ve gotta think on that a bit, it makes the whole mess even more cross-eyed then, because the two locations we know the time of day on are seriously at odds with each other. Lorraine definitely would seem to have activated the box in real time, but that’s impossible unless none of the lighting in the basement is natural and no reference time can be taken from that.. Unfortunately, I don’t have the means at the moment to capture the image, but isn’t there a shot, within the mushroom cloud in Part 8, that shows a globule (for lack of a better word) that looks close to if not exactly like the “small lump of some silver-tinted metal” that’s left behind after the black box implodes? I haven’t the slightest idea what to make of it; I only remember that I was struck by the resemblance at the time, when first viewing Part 8. I’ll try to follow up to this comment with an image. Excellent write up, by the way! I certainly did, as pointed out by you and some others. Fixed that section before things got out of hand. Thanks for catching me on that, I need more sleep.. I love that information about the tunnels. Thanks! This is a fantastic piece! I have a theory about “Lorraine’s Cardboard Wall Art.” While I thought of it on my own viewing the image, I see now that others in the thread for the post on the subject at WTTP have already noted this: there is a tube poking out of a hole in the middle of the cardboard, and it sure looks a lot like a camera. This makes a lot of sense. EvilCoop is into surveillance, and it wouldn’t be the first time a camera had been positioned in a sensitive area. I think it’s a hastily created surveillance system covered by cardboard. What a superb read, thank you Brien! Great write up. I could not figure out what wasn’t up with the box. I think you nailed it. Third Day Theories: A Recap of the Latest Theories, Analysis and Predictions Generated from Season 3 Part 17, The Past Dictates The Future, and Part 18, What Is Your Name? 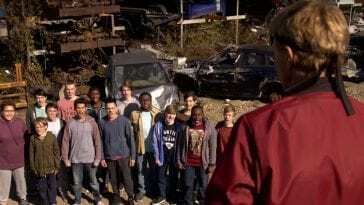 Third Day Theories: A Recap of the Latest Theories, Analysis and Predictions Generated from Season 3 Part 13, What Story Is That, Charlie?